Personal data you share with us: When you order from us, either on the website, by telephone, by fax or EDI, when you register for an Expanded Metal Company or ExMesh Security account or when you sign up to our mailing lists, we may ask for (one or more of) your name, email address, invoice address, delivery address, telephone number, credit or debit card number, billing address, card, CVC number, the card’s expiry date and a contact phone number for the registered address of the card. During interactions, you may be asked if you would like to provide your name, e-mail address or other contact information. Personal data we receive from other sources: When you interact with us, or use any of our pages on social media sites, such as LinkedIn and Twitter, we may collect information about you which could include personal data. For example, when you “Like” a post on LinkedIn or “Follow” us on Twitter. Those social media sites will also have their own privacy policies explaining how they use and share your personal data. You should carefully review those privacy policies before you use those social media sites, to make sure that you are happy with them. provide you with our products and to fulfil orders that you place with us on our website, through our customer service team and EDI. send you newsletters, updates, promotions, product highlights. analyse how our Website/s are used, so that we can constantly improve the services that we offer. service providers who help us to operate our Website, fulfil your orders and deliver our products to you; for example, credit reference agencies, couriers, payment providers, distributor partners ,IT support and so on. Some information is collected using cookies and other similar technologies. You can find more information on what cookies and technologies are used, how they are used, and your options for changing how we use them in the section below on “Cookies” and in our Cookies Policy. From time to time, we may send you aftercare e-mails relating to your Expanded Metal and / or ExMesh Security product. We may also send you e-mails with information in relation to any products which are similar to your Expanded Metal / ExMesh Security product, and which we think you might like. We will also only share your personal data with third parties (including Expanded Metal and Sorst Streckmetall) for them to send you marketing e-mails, if you have agreed that we can. If you have registered for an account with us, and when shopping online,, you have put items in your “Shopping Bag” and then abandoned them, we may send you e-mails to remind you of what you may be missing. In any case, you can ask us to stop contacting you at any time by contacting us on sales@exmesh.co.uk or +44 (0) 1429 867 388 or by using the unsubscribe option in each e-mail. We care about your personal data and know that you trust us to keep it secure. We use appropriate technical and organisational measures, including encryption, to protect your personal data, and review those regularly. Unfortunately, the transmission of personal data via the internet is not completely secure. Although we will do our best to protect your personal data we cannot guarantee the security of your personal data on transmission via the internet. Where we have given you (or where you have chosen) a password which enables you to access certain parts of our Website/s (for example, for your Expanded Metal / ExMesh Security account), you are responsible for keeping this password confidential. We ask you not to share your password with anyone. You have the right to ask us to update and correct any out-of-date or incorrect personal data that we hold about you free of charge. You also have the right to access any personal data that we hold about you. 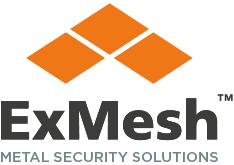 If you would like to update, correct or access the personal data we hold about you, please contact us on sales@exmesh.co.uk or +44 (0) 1429 867 388.